Reinstalled your computer, but forgot to backup your iTunes library? Fortunately, you have all data on your iPad. Thus you may want to transfer them back to your iTunes library. However, it's not easy to transfer iPad data to iTunes, because, in order to keep iTunes users from copying DRM files, Apple makes it impossible to copy files from the iPad to your iTunes library. 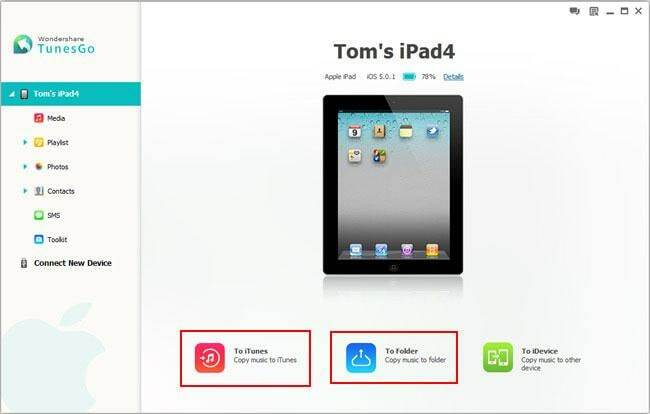 Thus, to transfer iPad data, like music and video, you need an iPad to computer transfer, like Wondershare MobileGo for iOS (Windows) and Wonershare MobileGo for iOS (Mac). As a professional iPad to computer transfer, it freely transfers videos and music from iPad to computer/iTunes with high quality and fast speed. Besides, it helps you convert and transfer almost any kind of video and audio formats to iTunes supported ones, like AAC, WMV, AVI. Thus, transferring music and video to your PC and iTunes is no trouble now! Here, we would like to take MobileGo for iOS (Windows) as an example. Below is the guide on how to transfer videos and music from iPad to iTunes and PC in Windows. Now, download the iPad to computer transfer and follow us! In the following part, we’ll take the Windows version as an example. If you use the Mac version, you are unable to transfer videos and playlists from iPad to iTunes. Note: Please download and install iTunes on your computer before using MobileGo for iOS. To export music to iTunes/PC, you can directly click "Export Music to iTunes" or "Export Music to Computer". 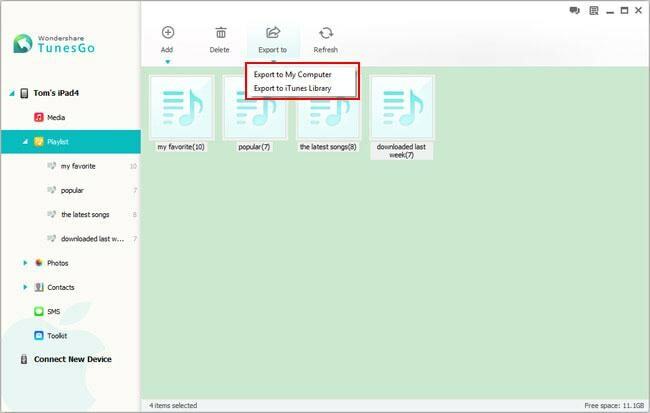 If you intend to sync music from iPad to iTunes, choose "Export to iTunes library" after clicking the inverted triangle under "Export to". Or, you can just click "Smart Export to iTunes". It will transfer all music files not found in iTunes to iTunes. Note: MobileGo for iOS is fully compatible with all iPads, namely, iPad mini, iPad with Retina display, The New iPad, iPad 2 and iPad. If you want to transfer playlists to iTunes and computer, click “Playlist” in the left column. Choose your desired playlists and click the triangle under “Export to”>”Export to My Computer” or “Export to iTunes Library”. Note: The Mac version doesn't support exporting playlists to Mac and iTuunes. Besides, it doesn't let you transfer videos to iTunes either. 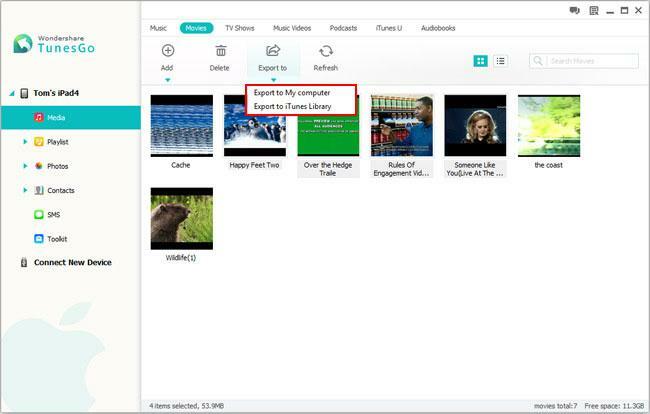 This program also enables you to copy video from iPad to computer. Click "Movies" in the media window. Then select the video you want to transfer and then click the triangle under "Export to". Then click "Export to My computer" or "Export to iTunes Library". Done! You have finished transferring video, music from iPad to iTunes/computer. 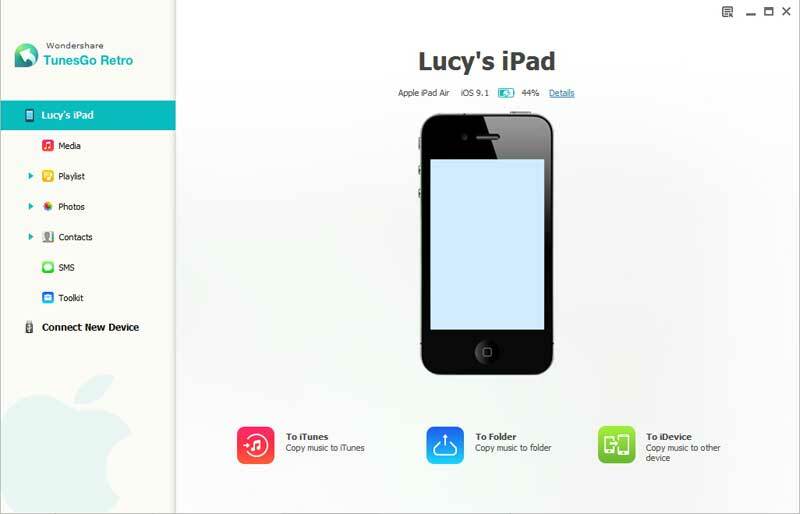 This iPad to PC transfer can not only transfer iPad data to iTunes/PC, but also can transfer iPod/iPhone data to iTunes/PC and helps you organize music, video, playlists, photos and contacts. Actually, Wonderhsare MobileGo for iOS fully supports iOS 5.0 and later. If your iPad runs iOS 4.0 or former, I recommend you to try Wondershare iMate. 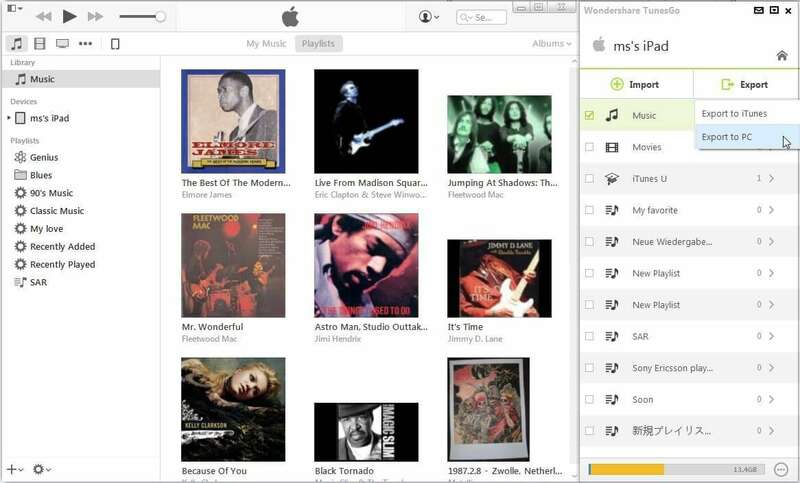 This program also empowers you to copy music and video on your iPad to iTunes and your computer. To download Wondershare iMate, you can click here. Now, Download MobileGo for iOS to try it yourself!